Become one of the richest gangsters of a Galaxy Far, Far Away with the Jabba the Hutt Supreme Edition Costume! 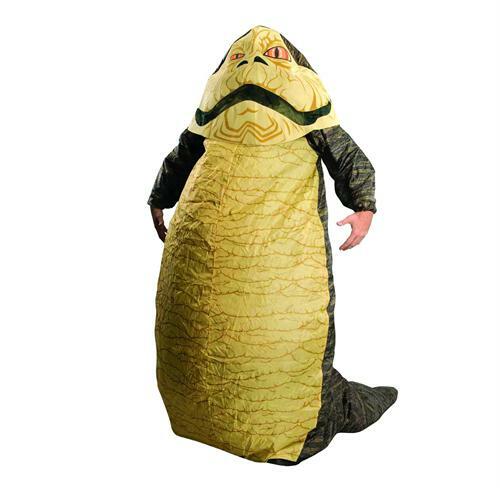 This full-body costume will transform you into the famous Hutt with a body piece (complete with tail), headpiece, and a battery-operated fan to keep you cool. When NCS started accepting preorders for the Hutt costume, we assumed there'd be apathy from the marketplace. Wrong. It sold like gangbusters and we're thinking there's going to be a bunch of Jabbas roaming around the streets when Halloween 2009 rolls around. The manufacturer Rubie's Costume Company doesn't state what the costume is made of on the product packaging but we originally assumed highly flammable plastic. It's actually made of a mix of cloth and polyester based on our touching and feeling of the costume that we're keeping for our private collection. An orange fan with on-off attachment is included with each costume to inflate the Jabba suit to its full girth. NCS will probably hire someone to wear the Jabba outfit and a sandwich board whenever the Playstation 4 is announced so we can get some local pre-sales. We're just hoping the cops won't arrest whomever we hire for causing a spectacle and possibly a public nuisance by way of Jabba. All preorders are shipping today but the costume is currently sold out. This document is partially ©NCSX 2009. All rights reserved. No reproduction in whole or in part of this document may be made without express written consent of National Console Support, Inc.
Poor R2. Once a champion on the silver screen who saved Jedi and Rebel hides alike from certain death, the droid has fallen from grace. Boba Fett is the son of Jango and the two are/were fearsome bounty hunters. Boba has inspired numerous toys over the past few years but Medicom shows him love and devotion by announcing a Star Wars Kubrick collection dedicated to him and him alone.